Chita Rivera (born January 23, 1933) is an American actress, dancer, and singer best known for her roles in musical theatre. She is the first Hispanic woman and the first Latino American to receive a Kennedy Center Honors award (December 2002). She was awarded the Presidential Medal of Freedom in 2009. Rivera was born Dolores Conchita Figueroa del Rivero in Washington, D.C., the daughter of Katherine (Anderson), a government clerk, and Pedro Julio Figueroa del Rivero, a clarinetist and saxophonist for the United States Navy Band. Her father was Puerto Rican, and her mother was of Scottish and Italian descent. Rivera was seven years old when her mother was widowed and went to work at The Pentagon. In 1944, Rivera's mother enrolled her in the Jones-Haywood School of Ballet (now the Jones Haywood School of Dance). Later, when she was 15, a teacher from George Balanchine's School of American Ballet visited their studio; and Rivera was one of two students picked to audition in New York City; she was accompanied to the audition by Doris Jones, one of the people who ran the Jones-Haywood School. Rivera's audition was successful, and she was accepted into the school and given a scholarship. On December 1, 1957, Rivera married dancer Tony Mordente. Her performance was so important for the success of the show that the London production of West Side Story was postponed until she gave birth to the couple's daughter Lisa. In 1963, Rivera was cast opposite Alfred Drake in Zenda. The Broadway-bound musical closed on the road. In 1975 she appeared as Velma Kelly in the original cast of the musical Chicago. In 1960, Rivera created the role of Rose in the Broadway smash Bye Bye Birdie. She won raves for her performance, but was passed over for the film version where it was played by Janet Leigh. In 1984 she starred in the musical The Rink with Liza Minnelli and won her first Tony Award for her role as Anna. In 1986, while performing in the Jerry Herman musical, Jerry's Girls, Rivera was in a severe accident when her car collided with a taxi on West 86th Street in Manhattan. Injuries sustained included the breaking of her left leg in twelve places, requiring eighteen screws and two braces to mend. After rehabilitation, Rivera continued to perform on stage. Miraculously revitalized, in 1988, she endeavored in a restaurant venture in partnership with the novelist, Daniel Simone. The eatery, located on 42nd Street between 9th and 10th Avenue, was named 'Chita's' after her. It soon became a significant attraction for the after-theater crowds and remained open until 1994. In addition to her ballet instructors, Rivera credited Leonard Bernstein and Gwen Verdon, with whom she starred in Chicago, as being people from whom she learned a great deal. She appeared as Fastrada in a filmed-for-television version of the musical Pippin in 1981. In 1993, she received a Tony Award for Best Leading Actress in a Musical for her portrayal of Aurora in the musical Kiss of the Spider Woman, written by Kander and Ebb. Rivera starred in the Goodman Theatre production of the musical The Visit (also by Kander and Ebb) as Claire Zachanassian in 2001. In 2008 she appeared in a revised production of the musical at the Signature Theatre in Arlington, Virginia, co-starring George Hearn. In 2003, Rivera returned to Broadway in the 2003 revival of Nine as Liliane La Fleur, and received her eighth career Tony Award nomination (Best Featured Actress in a Musical) and fourth Drama Desk Award nomination (Outstanding Featured Actress in a Musical). She appeared with Antonio Banderas. She later appeared on the revival's cast album. On television, Rivera was a guest on The Judy Garland Show. She guest-starred along with Michele Lee in a February 2005 episode of Will & Grace, and in December of that year, Chita Rivera: The Dancer's Life, a retrospective of her career, opened on Broadway. She received another Tony nomination for her self-portrayal. Though she was expected to reprise her role in a Signature Theatre staging of The Visit in autumn of 2007, that was later postponed to the following season. Instead, she performed at New York's Feinstein's At The Regency supper club in New York for two weeks. Rivera performed in a staged concert of The Visit as a benefit at the Ambassador Theatre on November 30, 2011. In the 1960s Rivera had recorded two albums, Chita Rivera: Get Me To The Church On Time and And Now I Sing. These early 1960s albums will be reissued on CD by Stage Door Records in February 2013. In November 2008, Rivera released her third solo album, And Now I Swing. Rivera performed on The Carol Burnett Show. Show #422. Original air date February 22, 1971. In 2012, Rivera played "Princess Puffer" in the new Broadway revival of The Mystery of Edwin Drood at Studio 54. She was the Grand Marshal of the Puerto Rican Day Parade in New York City on June 9, 2013. Rivera returned to Broadway in The Visit, the final musical written by John Kander, Fred Ebb and Terrence McNally. The musical opened at the Lyceum Theatre on March 26, 2015 and closed on June 14, 2015. Co-starring Roger Rees, the production was directed by John Doyle and choreographed by Graciela Daniele. Rivera received praise for her performance, and was nominated for a Tony Award, Best Performance By a Leading Actress in a Musical. Rivera has been nominated for the Tony Award ten times, as either Best Featured Actress in a Musical or Best Actress in a Musical. This is the current record for the most individual Tony Award nominations, which she shares with Julie Harris. 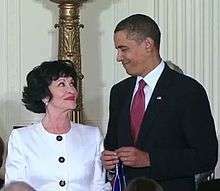 ↑ "In 35 Years, Kennedy Center has Honored Only One Hispanic American…Chita Rivera", AllGov, December 4, 2012. ↑ "Biography". ChitaRivera.com. Retrieved July 7, 2015. 1 2 3 4 5 6 7 8 9 Ratner-Arias, Sigal. 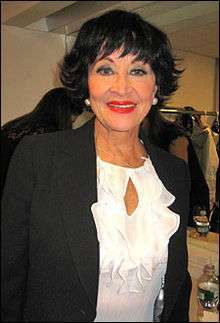 "Q&A: Chita Rivera reflects on life in the theater" etaiwannews.com (Associated Press), September 4, 2009. ↑ Haun, Harry. "A New Kind of Spider Woman: Chita Rivera Wows Broadway Crowd in Concert of Kander & Ebb's 'The Visit'", playbill.com, 1 December 2011. ↑ Hernandez, Ernio (22 February 2008). "Photo Call: Chita Rivera Crowned Queen in 'Johnny and the Sprites'". Playbill. Retrieved 2 February 2015.